Some may see this obsession with perfection as the culmination of a long trend; tiger moms have been pushing their children to be intellectual decathletes for generations. But it may actually be a reversal of an even longer trend. At the turn of the last century, the influential philosopher John Dewey saw education as a democratizing force not just in its social consequences but in its very process. Dewey believed that education and life were inextricably bound, that they informed each other. Education wasn’t just something you did in a classroom to earn grades. It was something you lived. The modern corporate university hardly resembles John Dewey’s vision of education as a democratizing force. Gabler’s depiction (in the rest of the article) hits the nail on the head. I often get the impression that academia is no place for activists, but Gabler demonstrates wonderfully the importance of reflection on the role of higher in our society and the roles of students, educators, or administrators, and then changing those aspects that do not harmonize with our vision of education. So, who is with me in the revolution? [people at the top are] willing to let people think about mild reforms and little changes, and incremental changes, but they don’t want people to think that we could actually transform this country into a peaceful country, that we no longer have to be a super military power. They don’t want to think that way because it’s profitable for certain interests in this country to carry on war, to have military bases in 100 countries, to have a $600 billion military budget. That makes a lot of money for certain people. But it leaves the rest of the country behind. His words are still gripping, true as they’ve ever been. 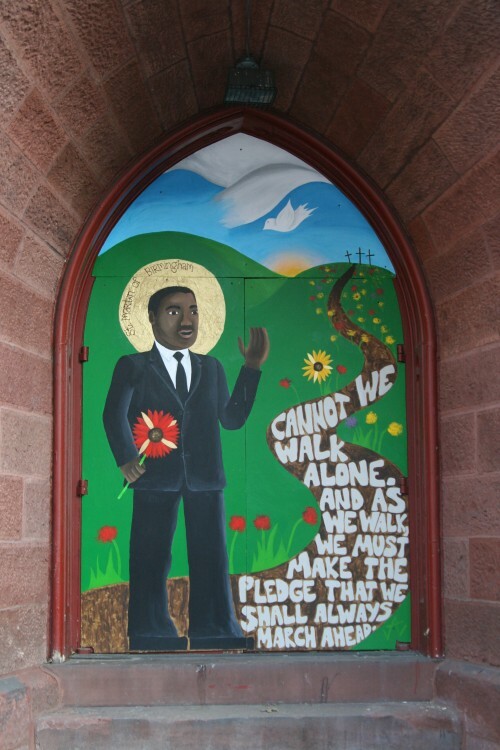 Who will be the MLK of the working class, the impoverished class, the jobless class? It’s likely that there is no such person. Instead, we’ll have to organize ourselves to make the world as it is into the world as it ought to be. The mural above was painted by a member of my church and installed this weekend. Here is a link to our senior pastor’s dedication. One of the constraints I mentioned on social change in an earlier post is that we need to test proposed new institutions in terms of how they would work, given people as they are (post). But this is slightly questionable, in that it takes existing social consciousness as a given rather than being itself an object of change. In particular, a successful outcome of either of these struggles entailed changing more than laws and institutions; each required a change of consciousness and morality in the white population of power-holders. If the majority of the white population had remained violently racist, then democratic racial equality may not have been a sustainable social order…So a strategy for change required changing both structures and consciousness. And this means that we have to be reflective about what sorts of factors we take as fixed rather than changeable. This also implies a change of emphasis in the analysis of social progress argued previously. Some crucial advances in social justice have been anything but continuous and gradual; but have rather been daring, improbable, and crucial. Being deliberative about strategies of social change does not imply being slow to act or reluctant to take on large challenges. We can imagine other characteristics we want our social institutions to promote as well. Being willing to re-imagine social consciousness, rather than take it for granted, is indeed a key element of achieving progress. There are a number of radical institutions that have attempted this sort of program (the Catholic Worker movement, the Mondragon cooperative, and others)- linking these efforts through things like the World Social Forum is key to form a more coherent and progressive consciousness. Most people who complain about High Fructose Corn Syrup and the pervasiveness of corn derivatives in our food are worried about the human health effects of consumption and the unsustainable nature of corn mass-production. In Staley: The fight for a new American labor movement, Steven K. Ashby and C. J. Hawking remind us about another perspective on corn syrup: labor conflicts in the processing plants. The authors report on the events at the Staley corn processing plant in Decatur, Illinois in the early 1990s. He would talk to his employees. He would ask them what they needed. Sometimes it would be pay advancement, food, or coal, and when that employee got home, he had his food and coal delivered. Gus Staley inherited the company after his father’s death, and although he had a different style of management, he still viewed the company as having a social responsibility to Decatur, and the company remained profitable. The Staley family’s relationship with the company ended in the 1975, however, with Gus Staley’s death. Thereafter, the working conditions began to deteriorate and reached a nadir when Tate & Lyle bought the company in 1988; their disregard for safety standards lead to the death of a worker in 1990. In response, the workers utilized innovative labor tactics, called “work to rule,” where workers use their power on the shop floor to take control of the labor process. These legal tactics include slowing down the production process and following safety standards. Production was slowed, but the company reacted by locking out the workers for 30 months. 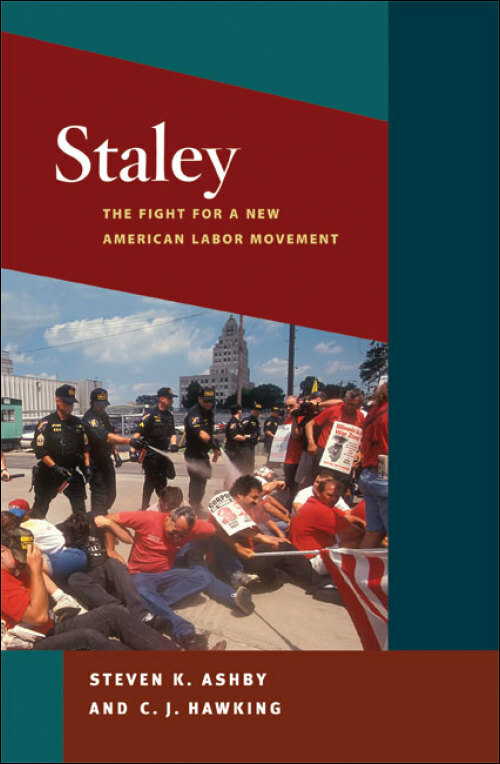 The book has a unique inside perspective because the authors spent significant time living with and interviewing the Staley workers and community members. The worker’s courage and creativity offers hope for the future of American labor, despite the immense decline that the movement has experience since the 1980s. The Jack Kerouac School of Disembodied Poetics, founded in 1974 by Allen Ginsberg and Anne Waldman, has thrived in the tradition of the Beat movement as a center for avant-garde and experimental writing. But recently, the University has been facing financial difficulty, and as a result of restructuring and layoffs, the future of the program is uncertain. Students, who have largely been left out of any decision making processes, are demanding their voices be heard by the administration while trying to keep the program intact. They are demanding greater transparency and a role for student input. “Save TKS” has been using social networking sites including facebook to spread their message. This issue is not just about Naropa. It is about student involvement in US higher education. Should students be treated simply as consumers of this product called education? Or, in the rich tradition of student activism at Naropa and other US campuses, should students be able to take charge of their education? I hope that educators and administrators learn to treat students as the stakeholders that we are in the institutes of higher education, and truly hold us to being intellectually curious when they encourage us to be so. As Little points out, this explanation makes no account of organizational features that lead to rebellion. I think that the idea of subsistence ethic emphasizes the challenge of social action in the developed world. We are no longer a country with pitchfork rebellions. In fact, most everyone I know (and obviously this is a function of my upbringing), who has engaged in social action has first engaged at an intellectual level. Can there be massive transitions from this- will enough people engage that way? I wonder if we can come up with a parallel ESM for American society and determine the conditions necessary to move it to widespread action. Of course, these questions might be better answered by a budding anthropologist- cough (Sean) cough.